From left to right: Justin Rennie, Chief Fisheries Officer, Grenada; Mrs. Marilyn Austin-Cadore, Permanent Secretary, Ministry of Agriculture, Lands, Forestry, Fisheries and the Environment of Grenada; Hon. Simon Steele, Senator & Parliamentary Secretary, Ministry of Agriculture, Lands, Forestry, Fisheries and the Environment of Grenada; Andrew Magloire, Chief Fisheries Officer, Dominica; and Milton Haughton, CRFM Executive Director. St. George’s, Grenada - Fisheries officials who spoke at the 13th Meeting of the Caribbean Fisheries Forum, held in St. George’s, Grenada, earlier this week, highlighted the need for collective action by the 17 member states of the Caribbean Regional Fisheries Mechanism (CRFM), in order to overcome the mounting challenges which confront the fisheries and aquaculture sector of the Caribbean. During the Forum meeting, Andrew Magloire, Chief Fisheries Officer of Dominica, turned over the chairmanship of the Caribbean Fisheries Forum to his counterpart from Grenada, the host country. “Central to this, we see the ratification and acceptance or adaptation of the Common Fisheries Policy, which has been a mechanism that we have been working on for the last 12 years, and it is most heartening for me to stand here as outgoing chair knowing that we have finally come to the point of the acceptance [and] adoption of the Caribbean Community Common Fisheries Policy,” said Magloire. He added that a major challenge remains: that is, bringing Caribbean countries together in the recognition that the region cannot sustain and develop its fisheries without integrating its processes in order to achieve the sustainable utilization and governance of the vital fisheries resources across CRFM states. “Dominica like many of our brother or sister states depends on those fishery resources to provide for our food security, to provide for opportunities of employment, and to provide for a level of food security of our people, knowing that we have a resource that can be sustained for years and for generations to come,” Magloire said. He called on CRFM member states to support the CRFM in bringing forth a work program geared towards sustainability and responsible governance of the fisheries resources in the region. The 13th Meeting of the Caribbean Fisheries Forum concluded after deliberations on the regional spiny lobster declaration, which the Forum is recommending for adoption by the CRFM’s Ministerial Council when it meets in Grenada in May. 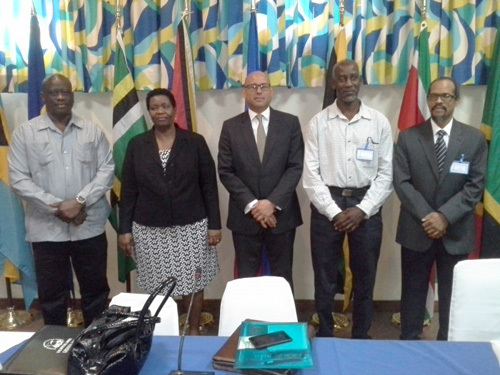 Representatives of CRFM partner agencies and institutions, such as the Food and Agriculture Organization of the United Nations (FAO), the Japan International Cooperation Agency (JICA), the Caribbean Natural Resources Institute (CANARI), the University of the West Indies (UWI), and fisherfolk organization, as well as private sector representatives, such as the representative of Spice Isles Fish House in Grenada, were among those who attended this week’s Forum meeting.